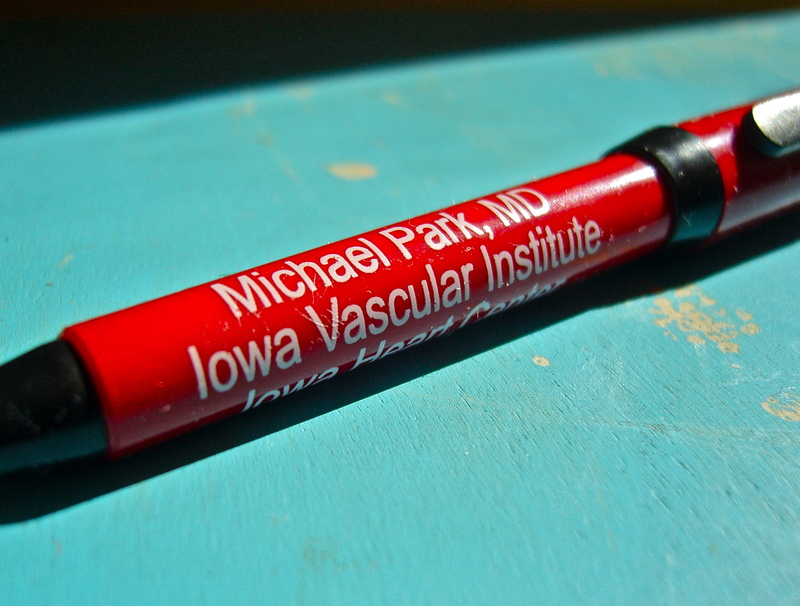 If you accept this pen, it is an implicit endorsement of me. The federal government cracked down on the allegedly briberous practice of pharmaceutical and medical device companies giving away pens and other swag (Plavix alarm clock anyone?) to physicians, nurses, office staff, and physician’s children. These rules were meant to avoid the impression that physician were endorsing these companies. I had always maintained that I could not be swayed by the giving of a pen, but if the government says so, so be it. The problem is that now people are hoarding the logo pens. I have my private stash of Viagra pens that I’ll now keep like reliquary pre-embargo Cuban cigars. It was in a fit of libertarian pique that I decided to invert the relationship between Giver of Pens and Taker of Pens. I decided to have my own pens manufactured, and have been giving them away at a torrid pace. There is no rule against my giving these pens to the drug and device sales reps -I tell them to drop them off wherever.